Beekeeping is a hobby full of many different kinds of interesting equipment. All pieces of equipment are not used by every beekeeper. Queen excluders are the subject of controversy among many beekeepers. Should you use a queen excluder on your beehive? That is a question that many new beekeepers ask themselves. And unfortunately, they get many different opinions. Again, one of the joys (curses) of beekeeping, lots of opinions. A queen excluder is an optional piece of beekeeping equipment. They are commonly made of metal or plastic. The purpose of the excluder is to prevent the queen bee from entering honey supers. When brood is in the honey supers, it makes harvest difficult for the beekeeper. Also, honey frames that have had bee brood in them are more susceptible to bee pests. Its just good beekeeping to keep the queen bee laying in the brood nest of the hive and not in the honey to be harvested. I failed to put an excluder on this hive in time. Argh, brood in my honey frame. What is a Queen Bee Excluder? Before we rush into the possible pros and cons of using a queen bee excluder (Queen Excluder), let’s examine the item. We don’t know the identity of the first beekeeper to come up with the idea of using an excluder. A metal queen excluder was made in France sometime in the mid 1800’s. Perforated zinc sheets with round holes were used. Beekeepers worried about damage to worker’s bees wings. Stiff wires were introduced to serve as the base of the excluder. The proper distance between the wires of a queen excluder is 165/1000 of an inch (.165) or 4.2mm. The excluder is used on Langstroth hives between the normal brood nest boxes and harvest supers. A Queen Excluder is placed between the brood nest and honey production boxes. How Does a Queen Excluder Work? One on the first things we learn about bees, is that the queen bee is larger than workers. It is easy to notice the long plump abdomen of a queen bee. But the thorax (mid-section) of a mature queen bee is usually slightly larger than that of workers. This difference in thorax size prevents the queen from moving through the excluder. Is a queen excluder 100% foolproof? No. We have to remember that nature loves genetic diversity. Undersized or unmated queens will sometimes be able to squeeze through the wires. Also, as an excluder is used, it can become bent or warped reducing the effectiveness. On most occasions though, the queen excluder will keep the queen down below. The obvious benefit of using an excluder on your hive is keeping brood out of the honey supers. Why is this a big deal? It makes harvest time much easier and faster. 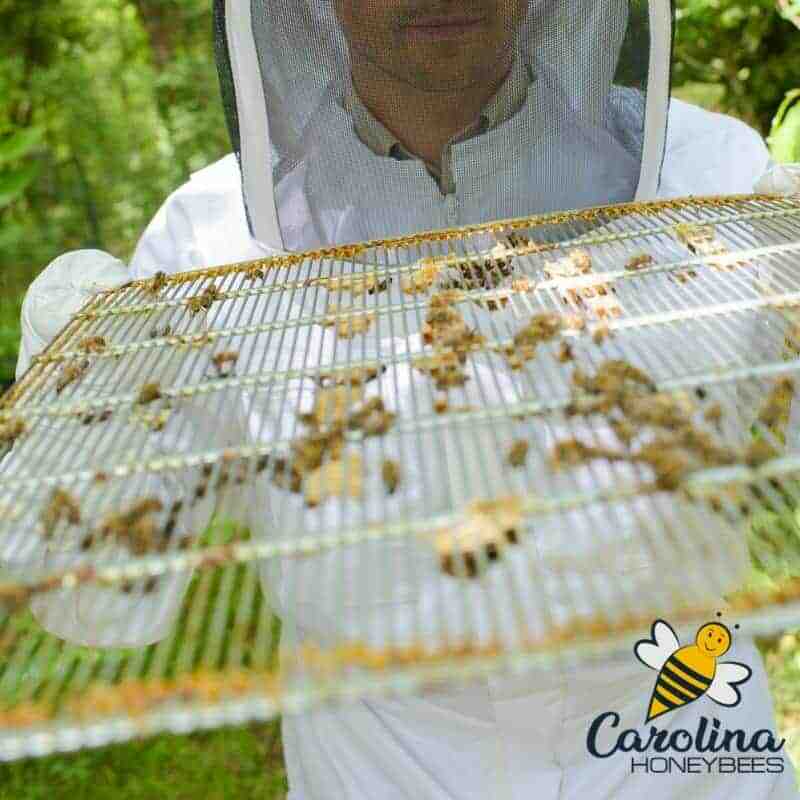 The beekeeper does not have to closely inspect each frame of honey. We can harvest the honey a box at a time without worry as to the location of the queen. If I had to spend a lot of time inspecting each frame in the bee yard, it might set off a robbing frenzy. By using a queen excluder, I am reasonably sure the honey boxes are brood free. Okay, this may get a bit tricky but I will deal with the known disadvantages first. They don’t always work 100% of the time. As stated earlier, some queens are able to squeeze through so you still have to do a minimal inspection. If you have no brood in the middle few frames, you are likely good to proceed with harvest. Drone bees are larger than queens and get stuck. Yes, they do. It is not unusual for me to find a couple of dead drones stuck in the wires of my excluder. I do regret it but it is not a big issue for me. Some beekeepers feel that you get less excess honey when using excluders. They believe that busy workers are reluctant to want to go through the excluder with nectar. This slows production and may increase swarming due to excess honey in the brood nest. I have seen no reliable studies that prove this statement. And I have not seen a noticeable difference between hive performance in my bee yard. The size of a honey crop has so many variables to consider that isolating 1 thing is not easy. Does queen excluder use reduce your honey crop? I am on the fence for this opinion, as I see the merit in both points of view. For now, I say “no” they do not – especially with the use of an upper entrance. Some claim that the worker bees wings are damaged from crawling through an excluder. Again, no definitive answer. Where to Put the Queen Excluder? The queen excluder should go under the first one of YOUR honey collection boxes. If your standard hive configuration is a deep and a shallow, the excluder goes on top of the shallow. The queen excluder goes directly below your honey collection box. Which Side of the Queen Excluder Goes Down? There will be a support wire underneath the main section of wires. The support wire side should face down towards the brood nest area. 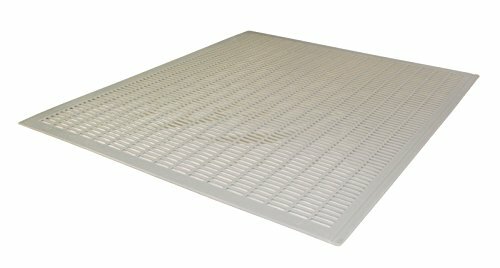 Do You Remove a Queen Excluder in Winter? YES ! When you harvest your supers of honey, take off the excluder. Do not leave the excluder on the hive over winter. Perhaps you decide that rather than taking the extra honey you will just leave it for the bees. That’s okay but take that excluder OFF! During Winter, bees will move up in the hive. If the cluster moves up through the excluder to the top honey super, the queen bee is left to die. No excluders on the Winter beehive. Don’t Have an Excluder? What to do? 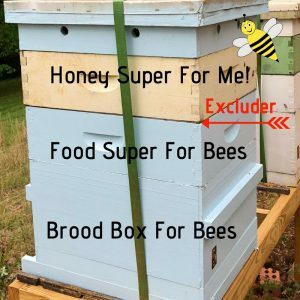 If you don’t have or don’t want to use an excluder, there is another method you can use to minimize brood in the honey supers. Honey bee colonies like to keep their brood together in a central area. They do not like having one area of brood in the bottom box. Then large areas of honey with more brood above. Before adding a honey collection box, make sure that every frame on the current top box has a “honey crown” or “honey barrier”. If you have at least 2” of capped honey on every frame. The queen will not “usually” cross that barrier. If Bees Won’t Go Through Excluder? If this happens to you, switch out 1 empty frame with one frame of honey from the box below. This should encourage the bees to come on up and get to work. A few weeks later, you can switch back. As a general rule, this is not necessary for my bees. It can be difficult to get bees excited about working on a box of foundation. When using an excluder and new boxes of foundation, its best to let the bees start to draw comb. Then make sure the queen is below and add your excluder. Once new comb is present, the bees will be more eager to go through the excluder. Our modern Langstroth hives have a front entrance at the bottom. On method I have found very useful is to use a top entrance for my hives. I have a special homemade Ventilated Inner Cover that includes a small upper entrance. 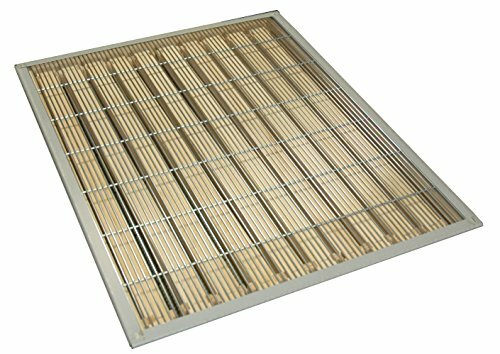 You can also accomplish this with a small 2″ shim (rectangle of wood) with a 1″ hole drilled in one side. This upper entrance is above the queen excluder and I leave the bottom entrance as well. In this way, workers or drones can enter and exit the hive from either entrance. My bees seem to really like this entrance. It gives them a way in and out of the honey supers without going through the brood nest. Once the warm season is over I can plug it closed for Winter. In Conclusion:Queen Excluders are a useful tool for beekeepers and especially new beekeepers. For many, the value of keeping brood out of honey harvest supers outweighs the possible downsides. Consider keeping a couple of excluders on hand, they are not very expensive.